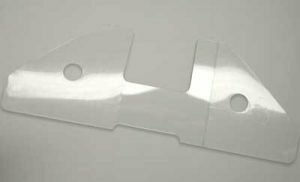 These Large Clear PowerTabs have been assigned B-grade seconds due to misalignment of the adhesive on the tabs. Mostly this is only one side. Adhesive misalignment ranges from approximately 1/8” to 3/8”. These tabs would be ideal for use a grommet reinforcements. They will significantly strengthen the grommet even for outdoor use. 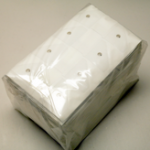 Bulk packaged 1000 tabs (250 sheets) per poly wrapped pack. A great deal for that application. For digital banners and graphics of all kinds. Use Banner Ups PowerTabs® to turn your digital image into a super-strong outdoor banner – instantly! Crystal Clear PowerTabs® let your color image shine through. Super strong for outdoor use. No sewing, grommeting or special tools required! Use PowerTabs® with virtually any banner media, Tyvek®, Coroplast®, Foamcore® , scrim vinyl, or paper. For outdoor banners over 8 feet, add PowerTape® for ultimate strength.